The IMB Media Room is a centralized facility that provides both pre-made sterilized media and custom ordered recipes. We offer a consistent high quality research media that may be used for all your research experiments throughout the duration of your project. We are staffed by trained, accountable personnel knowledgeable in the mixing of chemicals and the intricacies of a wide range of recipes. Agar plates can be made with a variety of recipes and in a variety of sizes. There are multiple sizes of plates that are stocked by the media room: 100x15mm, 150x15mm and 60x15mm. If your lab would like an alternative plate, you may provide them and we will work with you to fill them as best we can. Volumes can be ordered from 1/4L on up. 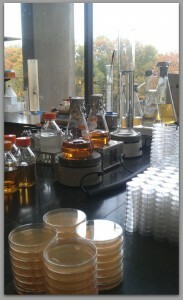 Please see the Agar Plates page for more details. Bottled media is also available in a variety of recipes and can also be in a variety of volumes. Our most commonly used bottled stock is pre-made and on our shelves in sizes ranging from 50ml, 100ml, 200ml, 400ml, 1L & 2L. However, you are able to customize your order to be made in any volume that is convenient for your project. 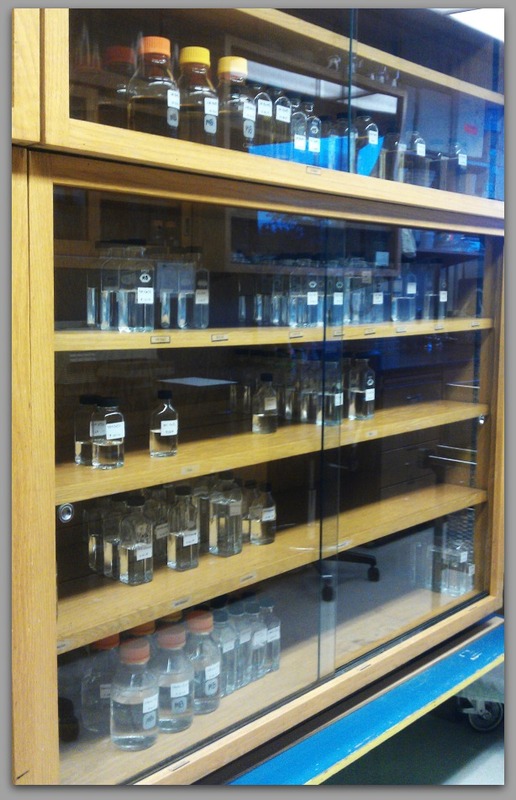 You may request that your media be contained in bottles, flasks, vials, stabs/slants or tubes. Or perhaps you would prefer a dry measurement of chemicals to be used later – we will work with you to decide what best suits your needs. To order from our standard stock or to request a customized recipe (see below) every on-campus user must have their project’s current index number (supplied by your PI). If you are an off-campus customer you may create an account and arrange payment by contacting our accounting department (see Contacts page). Once your account is established you may order and check out items as you would like using the Plate & Shelfstock Order Sheet and the Sign Out Book found in Room 241 Klamath. Charges are compiled and submitted to the IMB accounting department and are billed out on a monthly schedule. Please see our Billing & Pricing page for more detailed information. Labs with approved entrance keys are welcome to access the media room as needed — to place orders, pick up shelf stock or return empty media bottles. Off Campus labs may pick up their orders by coming to our lab between 7am-3:30pm Monday-Friday. If they are unable to arrive during our business hours we will place the items in the cubby behind the brown curtain outside the door of Room 241 Klamath. 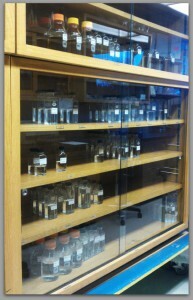 Researchers have the option to check out items from our stock of pre-made sterilized bottled media. We keep a rotating variety of salts, sugars, buffers, broths, etc on our shelves – the selection determined by the most frequently used items in our current customers projects. Come check out our stock … you may find that what you need is already prepared. (Note: we also maintain a stock of filter sterilized antibiotics — these are available for check out or as additions to your media orders). Items that are signed out from our stock should be signed out in the Sign Out Book located on the counter in Room 241 Klamath — lab personnel may sign out items under their lab’s individual page and individuals or off-campus researchers may sign items out under the “Miscellaneous Labs” page at the back of the book. Alternatively, customers may place individualized orders for media and agar plates either from our catalog of recipes or from a completely customized recipe…just contact us and we can discuss your options. (There is a list of the currently most requested recipes on the Frequently Ordered Media page). Custom orders may be placed on the Plates & Shelfstock Order Sheet found on the counter in Room 241 Klamath Hall — a more detailed description of the procedure can be found on the Agar Plates pages. Custom ordered items will be ready on the day at the top of the Plates & Shelfstock Order Sheet. Typically there are 2 – 4 weeks of ordering pages available at a time, allowing researchers to pre-schedule their orders as needed. When complete bottled media will be placed on the counter by the door of Room 241 Klamath and agar plates in the cubby behind the curtain by the door of Room 241 Klamath the next morning. Labs with approved entrance keys may also pick up their orders outside of our standard business hours. Phone: If you are unable to make it into the lab just give us a call at (541)346-5148 and we will place your order for you.